Can please someone find some similarities on this images? The first one is mine, the second not. Maybe its not easy to prove but not that hard to. Do you think that the balloons are the same? I'm pretty sure that are and the user change the composition and colors in photoshop like I have done to. But i am he owner and have the raw file of the balloons to prove. Even the shades and glare and colors of the balloons are the same. They bear some similarities but not enough to claim the copyright infringement, if that's what you are after. Do you think that the balloons are the same? Not even close - colors, shape, exposure are all different. Find something else to worry about. I checked just 5-6 balloons on the bottom and yes, they are same. My first impression is that yes, the second set of balloons is made by chopping up the first. I would have to download both and get them into Photoshop to be sure but I think there are some parts that are too similar to be coincidental. Take a look at some of the shadows on the balloons. You should probably get some closeup side by sides of the parts that are the same and repost if you want people to see what you are talking about. ETA, was writing the same time as above. So if I understand correctly I can download images from a Russian website that we all know distribute our images for free. And then make same new composites with that images? I do found several images on this portfolio, that i think (not sure) that are composites with images form someone. Now that you mention it and I'm looking more closely, there are about 8-9 at the bottom that look too similar to be a coincidence, but the rest are different. Maybe a composite? No, I don't believe you can take someone else's photo, chop it up, reconfigure it and sell it as your own. I haven't taken a look at 100%, but it looks to me like they did steal your balloons, and didn't even bother to make sense of them...the light source on the balloons in their photo is all over the place. Many, many suns in that world. I guess it raises the question of where all the other images (person, grass, buildings) came from as well. Now you get my Point! If people start looking into this profile will discover a lot of picture from themselves. But they have no model release and no info about the contributor? This part even has the same shadows. That outtake looks like a copy indeed. There is a tiny shadow on the ground, but not big enough for that whole thing and it fades out oddly. There's also no footprints. And some other things, like different direction of shadows. Maybe the OP's image is a comp as well. The original photo is not that one that I show it. That is a composite with a little diference, everything on the image belongs to me, and by the way very old images from 2011, much more olders than the other contributor. After this shoot I used there same balloons to make other versions, because is a pain in a hass, filling balloons dozens of balloons with Helio again. Where is the beach and girl photo from? Regarding footprints, I think I detect some slightly lighter ares but footprints would depress into the sand, therefore cause a shadow, no? Hard to tell without a hi rez to inspect, and frankly, I don't care that much. Anyone can say anything here. I love watching the one-upmanship. Where is the beach photo from? Do you even read anything before posting something? So funny, lots of guys ragging on you, but you choose my comment to call out. But just in case I missed something, I just went back and re-read YOUR posts. I don't see any mention of a beach. As soon as someone gets defensive, you know a nerve has been touched! No problem I just ask a opinion and then some people start distrust me. 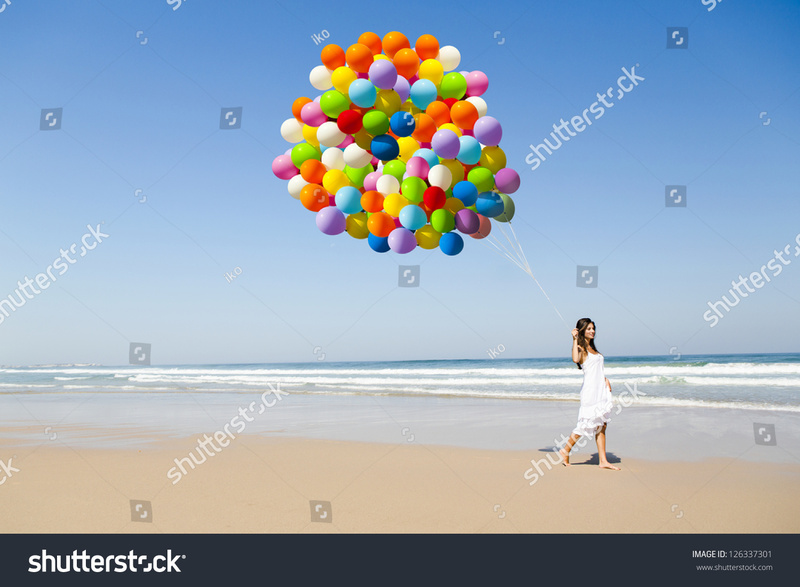 Here is a new Printscreen of my Lightroom with the original photoshoot where I only used a few red balloons, and if you look closely you can see the first image that i show here, and as I said is a composite. The woman in front is the model from the first photoshoot and also my girlfriend, the other one is the model that I work several times with her. How do you find your Images? How to find out where your images are used? Were to find sold images?